VILLAS AND APARTMENTS TO RENT IN LOS CRISTIANOS, TENERIFE, SPAIN. 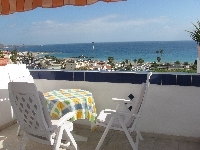 Welcome to our selection of holiday homes to rent in Los Cristianos, Spain. Los Cristianos is an older island town and from it's fishing village origins, it's grown into a delightful, relaxing holiday destination, serving visitors and delighting tourists since the fifties. There are many luxury holiday apartments in Los Cristianos, each giving you access to the wide variety of duty free shopping available. When you're looking for a good time after dark, Los Cristianos does have some excellent pubs and discos but if you wish to go to a more upbeat night out, taxis run around the clock, allowing you to spend the evening partying and return to your peaceful apartment in Los Cristianos. Los Cristianos is generally more relaxed than its neighbors, but there is still plenty to do. The beaches offer almost every water sport available, from Jet skiing and windsurfing, to big game fishing where you can catch blue marlin, yellowfin tuna or hammerhead sharks. The crystal clear waters are perfect for scuba diving and banana boat rides are one of a number of novelty attractions for children on the beach. Looking for self catering holiday accommodation in Los Cristianos? Then below is a selection of holiday apartments in Los Cristianos and holiday villas in Los Cristianos that can be rented direct from their owners. You can either click on each listing for further details or you can use our search engine on the left if you are looking for something in particular.